Mississippi was admitted as the 20th state on Dec. 10, 1817. The library will commemorate that recognition with an ongoing exhibit focusing on the history and culture of Mississippi, opening Jan 9. 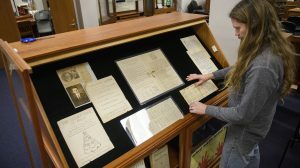 The exhibit will feature a wide variety of items that helped define the state, including 18th century maps of the South by European cartographers, historical Mississippi textbooks, early territorial documents, materials related to the women’s suffrage movement and the civil rights movement in Mississippi, sound recordings, photographs of the state through the years and Mississippi-themed sheet music. The archives will showcase various items from the display in a monthly video series through the end of the exhibit on Dec. 11, 2017. The department also will host several brown bag lectures and events throughout the year. Patrons are invited to check the J.D. Williams Library website, as well as the university’s events calendar, during the year for details. The Department of Archives and Special Collections is open 8 a.m.-5 p.m. Mondays-Fridays, except for university holidays. For more information, contact Jennifer Ford at 662-915-7408.